If working in the garden Thanksgiving weekend is not high on your list then you’re in luck. Here are some reasons why along with other information you need to know. In the category of news you can use. A reader shared with me that a plant I mentioned a couple weeks ago in my column about hedges- Italian buckthorn or rhamnus alaternus – has evolved and is now considered invasive by the California Invasive Plant Council. Seems that over the past 3 to 4 years Italian buckthorn ‘John Edwards’ has overcome the reproduction invasion barrier of being entirely dioecious (having male and female plants separate). The shrub has become a serious problem in riparian and other wildland areas. Birds love the berries which are apparently all female. Thank you to my faithful reader for sharing this information with me. Don’t plant this shrub. Being that November has was so dry up until the day before Thanksgiving I looked up the current El Nino rain prediction for this winter season. Interesting enough I found lots of info on the surfline website in addition to NOAA. Sounds like we’re still on track for California’s midsection to have an equal chance of more precipitation than other years and warmer than usual from December to February. Can’t come soon enough for me. For me the growing season is pretty much over except to enjoy what’s left of fall color and the ornamental grasses waving their seed heads in the wind. A lot of perennials are dying back but I’m not in a hurry to neaten things up. The seed heads left in the garden supply food for birds and other creatures while the foliage provides shelter for the plant in the cold and frost. Remove anything when it turns slimy or just plain unattractive but leave berries and seed heads for the birds and winter interest. And I don’t need to prune trees and shrubs at this time of year. Other than clipping a few well placed branches to use in a holiday wreath, I’m off the hook for this task right now. Deciduous trees are still in the process of losing their leaves and are not fully dormant. Evergreens shrubs and conifers can be trimmed lightly but most shaping is done when they start growing in late winter or very early spring. Earth Day celebrates the natural beauty of our planet and reminds us of what we can do to keep it healthy. Always on April 22nd, Earth Day is a day of education about environmental issues and is now a global celebration. In anticipation of this day I recently spent the morning in nature at the UCSC Arboretum where the birds and the bees were enjoying the nectar flowers. Whether you plant a tree, clean up litter, garden, hike in the woods or marvel at emerging wildflower, be in contact with the soil and breathe fresh air outside on this day. My day at the Arboretum started in the California native plant garden. Plants thrive when they’re natural to your area and the flannel bush, one of the most spectacular of our native shrubs, is a good example. Huge abundant deep yellow blooms cover the plant for a long time starting in the spring. Impressive swaths of rich blue Pacific Coast iris bordered the path. Nearby a bush poppy, covered with 2 inch yellow flowers put on it’s spring display. It will bloom sporadically for most of the year. The South African and Australian gardens at the Arboretum is where all the action takes place for hummingbird watchers. The courtship display of the dozens of Anna’s hummingbirds, taking place inches over your head, sure puts one in contact with nature. You can bring nature into your garden with plants that attract these jewels of the avian world as well as butterflies, bees and other pollinators. Planting wildflowers on Earth Day is a good place to start. Wildflowers like poppies, tidy tips, yarrow and baby blue eyes provide nectar and pollen for the pollinators, including honey bees, bumble bees and carpenter bees. Attract other beneficial insects such as ladybugs, parasitoid wasps and army worms to be the unpaid pest control agents in your garden. Beside wildflowers, plants such as aster, goldenrod and California fuchsia attract beneficial insects and are grown to attract, feed and shelter the insect parasites and predators to enhance your biological pest control. Everything is connected on the planet. The pincushion protea from South Africa is one the the brilliantly colored shrubs in this garden in the Arboretum. The flowers are striking, not only for their appearance, but also for their unusual structure and pollination sequence. They make a good long lasting cut flower. In the New Zealand garden a beautiful small shrub with small dark green glossy leaves and masses of showy, fragrant magenta pink tubular flowers was attracting butterflies. The Pink Rice Flower was in full bloom and would sure look great in my garden in my well drained soil. Remember that plants drink their food. If your soil dries out completely, your plants will starve. Take steps on Earth Day and the rest of the year to water wisely and retain the valuable moisture. Steps include improving your soil with organic matter, planning a smaller garden, choosing bush varieties of vegetables, placing plants closer together to shade the soil which helps conserve moisture and reduces weed growth. Mulch, mulch, mulch. Keep those moisture grabbing weeds at bay. Use a drip irrigation system to conserve water. Celebrate Earth Day this April 22nd and throughout the whole year. I may not be so fond of gophers but I never tire of the birds, butterflies and bees that visit my garden. I’m always on the look out for plants that will attract even more of these exquisite creatures and it’s one of the top requests for nearly every garden that I design. Fortunately there are many plants that fit the bill and have low water requirements for our summer dry climate. Trees that provide fruit, seeds, nectar and protein from insects attract many kinds of songbirds. Our native Big Leaf Maple is a favorite of the Evening Grosbeak who relish the seeds and early spring buds. Another bird magnet is the dogwood. Our Pacific dogwood as well as the Eastern dogwood and even the hybrid of the two, Eddie’s White Wonder, all are very valuable sources of food for many birds. Their summer berries are high in fat and important for migratory and wintering birds. 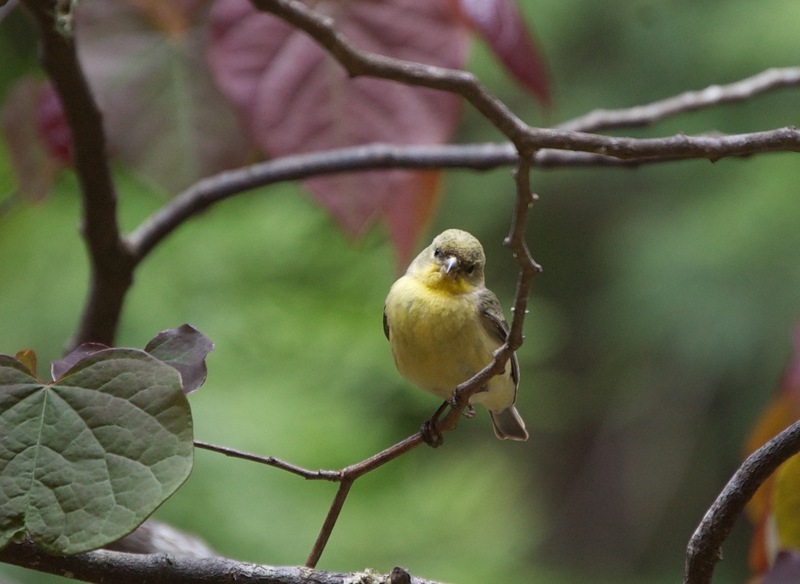 There are many great low water-use shrubs and perennials that attract birds. My favorite Lesser Goldfinch is partial to the seeds of yarrow, buckwheat and aster. Kevin’s mahonia is favored by Western bluebirds. Blooming now in our own neck of the woods is Mexican elderberry. Their butter yellow flowers will form purple berries rich in carbohydrates and protein and attract an incredible number of birds. And I always can find space for another variety of manzanita or ceanothus. Both hummingbirds and butterflies are attracted to flowers that provide nectar. Among their favorites that won’t break your water budget are natives such as penstemon and salvia. galvezia, mimulus, monardella. California fuchsia and ribes are also important nectar sources for birds in your garden. Add a couple non-native, drought tolerant perennials like lavender, gaura, coreopsis, verbena, scabiosa, lantana and wallflower and you’ll provide a feast for all your winged visitors. So how much water do different types of plants need during the heat of summer? As a rule of thumb, trees and large shrubs need deep but infrequent waterings. They should be on a separate valve than your smaller shrubs and perennials. Water ornamental trees 1-3 times per month depending on the type and soil. Tree roots grow 12-36” deep and require 10 gallons of water per inch of trunk diameter. Apply with a soaker hose, drip system emitters or hand held hose with shut off and soft spray attachment according to your water districts restrictions. Don’t dig holes in the ground in an effort to water deeply. This dries out roots even more. Be sure to water the root zone to the indicated root depth every time you water. Watering deeper than the root zone only means you are wasting water. You can test how deep you watered by pushing a smooth rod -1/4” – 3/8” in diameter- into the ground soon after you irrigate. The soil probe should easily slide through the wet soil but become difficult to push when reaching dry soil. The roots of smaller shrubs are 12-24” deep in the soil. Established native shrubs may need only monthly irrigation to keep them looking their best while other shrubs may need watering every 7-10 days during the heat of the summer. Perennial roots only go down 12” or so and may need watering once or twice a week depending on type. With lots of mulch and the above watering tips you can keep all your plants happy and healthy for the birds, butterflies and bees to enjoy. My ambitious plans to augment this garden here in Bonny Doon with California natives and colorful plants to attract birds and wildlife is not turning out exactly as I’d pictured. I thought that I had licked my gopher problem by planting everything in baskets. Not so, now they just come up next to their plant of choice at night and eat whole thing from the top, dragging the rest down into their neat little hole while leaving the root still snug in its basket. Hopefully, some will regrow from the roots. But I’m not giving up on planting for the birds and bees. I’ve got plans to increase my container garden collection. Gardening in containers is easy. I can control the soil, water and light and the gophers can’t undermine my efforts. There are a lot of California native plants that do well in containers and I’m going to place them where both the birds and I can enjoy them. For some of my largest containers I’ll choose from natives like Western Azalea, Deer Grass, Chaparral Pea or Giant Chain Fern. Any of the taller growing ceanothus and manzanita would look great too by themselves or combined with smaller growing plants. For small to medium containers I can use Conejo Buckwheat, Hummingbird Mint, Penstemon Heterophyllos, Mimulus, Woolly Blue Curls or Coastal Daisy, These combine well with colorful Lewisia, Dog Violets or Wild Strawberry. I might combine a madrone with a Canyon Gray Coastal Sagebrush – Artemisia californica – which grows about a foot high and will trail over the side of the container adding beautiful gray color to contrast with the rich green of the other leaves. I also like the combination of California Hazelnut, Deer Fern, Redwood Sorrel and Wild Ginger. Some of the most dramatic containers utilize the concept of combining a thriller, some fillers and spiller or two. Not all my containers will use this formula but I seem to be drawn to those that do. Plants in nature can be quite random in the way they grow together and still be lovely. Containers need a bit more order to dazzle and direct the eye. Thrillers act as the centerpiece of a container. They are usually big, bold and beautiful. Giant Elk Clover is one such California native that is an attention getter. Chilopsis linearis-Desert Willow is another great subject for containers as it is slow growing and beautiful in leaf and flower. Other architectural natives that will catch your eye as the centerpiece of a container are Hibiscus or Rose Mallow and Pacific Dogwood. The thriller goes in the center of the pot or if your container will be viewed from only one side it goes in the back. Next come the fillers. They can be foliage or flowering plants but they should complement and not overwhelm your largest plant. Usually they have a mounding shape and I’ll plant several around the thriller. Good fillers include Heuchera Maxima and Western Maidenhair Fern. The last plants I’ll add are the spillers which are small and will soften the edge of the container. Redwood Sorrel, Wild Ginger and Miner’s Lettuce are good choices. California Fuchsia would look spectacular with its red or orange flowers and grey foliage spilling down the side of my container. The best overall soil mix for natives in containers sharp sand and horticultural pumice added to a good potting soil. Never use perlite or that puffed up pumice because it will float and look terrible. Happy Container Gardening. My garden is alive with birds. Butterflies and bees also seem to find it an interesting place to visit. When I first moved up to this house in Bonny Doon the prior owners had hung a couple of small hummingbird feeders which attracted only a few hummers. Their plantings consisted of manzanita and ceanothus varieties. Both great plants to attract birds but not much diversity. It felt like I was living in a void without the sound of song birds or the whir of hummingbird wings. It’s taken me a season or two but between the new plants I’ve added and the seed, suet and nectar feeders I’ve hung throughout the garden I attract dozens and dozens of my winged friends. How is this all possible sharing the garden with two cats? I knew right away that I couldn’t live with myself if I attracted birds only to have them endangered by Sam and Archer. As natural predators they couldn’t help getting into trouble. The problem was solved by the brightly colored, clown-like collar from Birdsbesafe they each wear that makes them more visible to birds. Neither wore a collar previously but they don’t seem to mind or notice they look like court jesters. The birds in the garden are safe now or very nearly so and I’m happy too. It’s the height of breeding season and the birds are going nuts in the garden. I’m always on the look out for plants that will attract even more of these exquisite creatures. Fortunately there are many that have low water requirements which is a prerequisite these days. Trees that provide fruit, seeds, nectar and protein from insects attract many kinds of songbirds. Our native Big Leaf Maple is a favorite of the Evening Grosbeak who relish the seeds and early spring buds. Another bird magnet is the dogwood. Our Pacific dogwood as well as the Eastern dogwood and the hybrid of the two- Eddie’s White Wonder- are all very valuable sources of food for many birds. Their summer berries of dogwood are high in fat and important for migratory and wintering birds. In every garden possible I try to include low water use shrubs and perennials that attract birds. My favorite Lesser Goldfinch is partial to the seeds of yarrow, buckwheat and aster. Kevin’s mahonia is favored by Western bluebirds. Blooming now in our own neck of the woods is Mexican elderberry. Their butter yellow flowers will form purple berries rich in carbohydrates and protein and attract an incredible number of birds. Both hummingbirds and butterflies are attracted to flowers that provide nectar. Among their favorites that won’t break your water budget are natives such as penstemon and salvia. I always can find space for another variety of salvia. Galvezia, mimulus, monardella, California fuchsia and ribes are also important nectar sources for birds in your garden. Add a couple non-native, drought tolerant perennials like lavender, gaura, coreopsis, verbena, scabiosa, lantana and wallflower and you’ll provide a feast for all your winged visitors. Everybody loves winged creatures in the garden. Adding plants that attract birds, bees and butterflies is at the top of the list of requests for nearly every garden that I design. With the colder, rainy weather my feathered friends appreciate the seed in the feeders I have around my house even more. The Anna’s hummingbirds still frequent their feeders regularly now that the pineapple sage flowers and flowering maple are about the only nectar source in my garden. I strive to attract wildlife to my garden with the right plants, water and shelter. That brings me to Christmas. The turkey leftovers are gone signaling it’s time to dust off the Christmas list. I add an idea for a present for a loved one and then one for me. I’m the easy one. I like everything. Sometimes I’m stumped, sometimes it all comes together seamlessly but whatever I decide to give I know some of the best gifts are the ones from nature or that I make myself. With that in mind I have a few ideas up my sleeve. A friend loaned me a book entitled ‘Wildlife Gardens’ that is published by the National Home Gardening Club. Within the 8 chapters, ranging from “Who’s Out There and What are They Looking For” to “When Wildlife is a Problem” are many ideas, reminders and advice to discover the wildlife garden. Whether yours is a young friend or a long time friend that’s on your gift giving list, there’s a gift idea from nature for everyone. The wildlife garden is a place to relax and recover a sense of connection with other creatures. Nesting boxes, flowers and other plants encourage birds to make their homes in your yard. Give a bird feeder or suet feeder to someone and they’ll be hooked. You can make simple feeders yourself. A platform with edges gives many birds a chance to feed at once. You can add a roof supported by branches you find in your own garden to upgrade the look. Swallowtail butterfly feeding on butterfly bush. plant or offset of one of your plants that birds, bees or butterflies would appreciate? Some easy-to-divide favorites that attract birds include foxglove, coral bells, red-hot poker, California fuchsia, mahonia and purple coneflower. You might have one of the following butterfly favorites that you could divide and pot up for a friend. 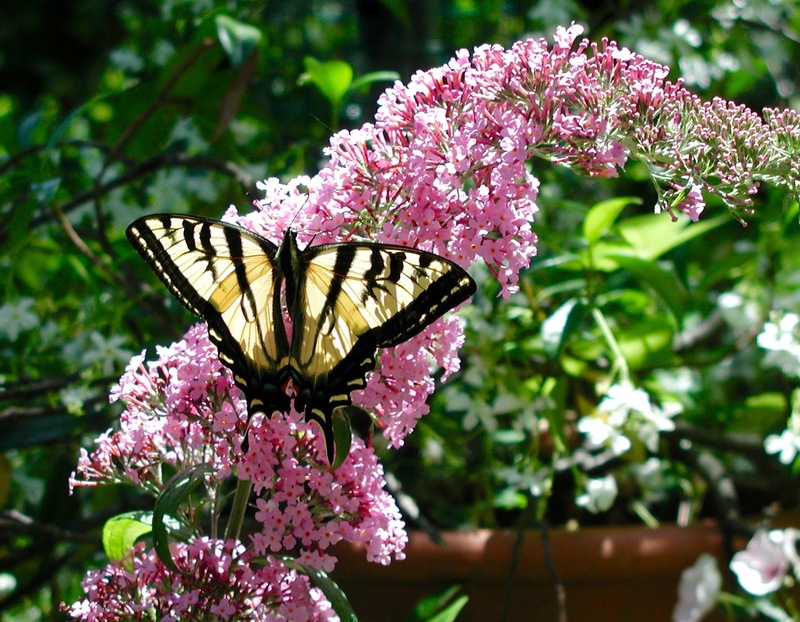 Yarrow, aster, veronica, agapanthus, astilbe, coreopsis and gaura to name a few that butterflies favor. Ceanothus and columbine are two plants that self sow in my garden and would be great to pot up for a gift. A fun thing I like to do during the holidays is decorate a plant or tree outside with edible ornaments for the birds. You could trim an evergreen swag and decorate it as an easy gift. Both fruit-eating and seed-eating birds will appreciate the dietary boost during the lean winter months. For the fruit-eaters attach dried apples, hawthorn berries, cranberries and grapes to the greenery. You can also thread them onto wire loops with raw whole peanuts in the shell and wire orange slices to the branches. Seed-eaters relish stalks of ornamental wheat tied to the branches, along with ears of dried corn. The favorite of all the “ornaments” is peanut butter-coated pinecones encrusted with wild birdseed mix and hung with florist wire. Millet sprays tied to the branches are a hit, too. Look around your garden for other berries that you can use to decorate your own trees or plants or a swag of evergreen cuttings as a present for the birds and the nature lover on your list. Also on my list of gift ideas is a dry arrangement of seed heads, pods and foliage from my garden in a thrift shop container or tea tin. 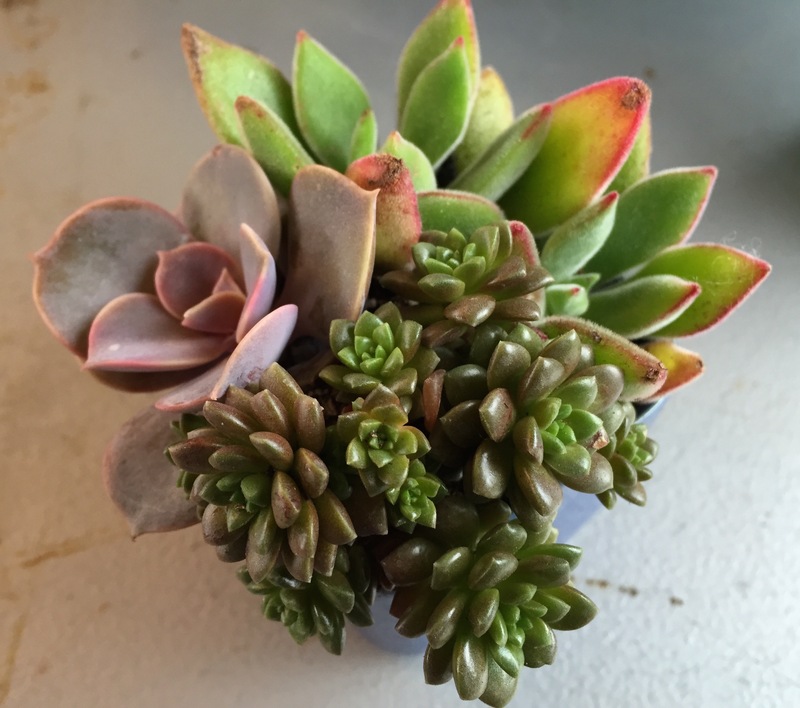 A selection of little succulent cuttings you can spare look great in a recycled container or pot and would be a welcome addition to anyone’s kitchen window. The holidays, maybe even more this year, are a time to bring a smile to someone you care about. Your gift doesn’t need to cost very much to show your love.